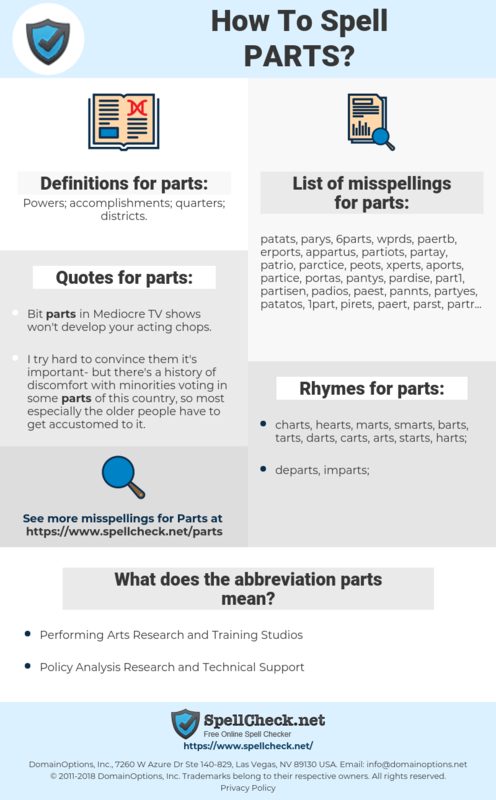 What are the misspellings for parts? What are the common mistypes for parts? What is the definition of parts? What does the abbreviation parts mean? What are the quotes for parts? What are the rhymes for parts? What are the translations for parts? 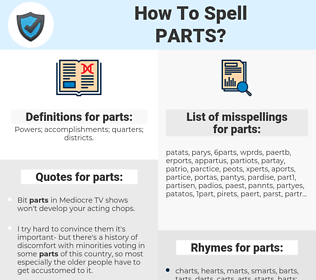 What are the common typos for parts? This graph shows how "parts" have occurred between 1800 and 2008 in a corpus of English books. I try hard to convince them it's important- but there's a history of discomfort with minorities voting in some parts of this country, so most especially the older people have to get accustomed to it. To the socialist no nation is free whose national existence is based upon the enslavement of another people, for to him colonial peoples, too, are peoples, and, as such, parts of the national state. So when you ask me how string theory might be tested, I can tell you what's likely to happen at accelerators or some parts of the theory that are likely to be tested. delen, onderdelen, stukken, componenten, gedeelten, bestanddelen. parti, parties, pièces, morceaux, composantes, composants, quartiers. stellen, Teile, Ausschnitte, Bestandteile, rollen, Ersatzteile, Bauteile, Bereiche, Anteile, Einzelteile, Parts, Werkstücke, Abschnitte, Teilstücke, Geschlechtsteile, Genitalien. repuestos, partes, lugares, componentes, accesorios, zonas, piezas, elementos, secciones, porciones, recambios, sectores, apartados.